Dashcams can be a great companion when dealing with insurance companies, providing proof for your version of events. Or they can just record some hilariously bad driving for YouTube. Historially, they have been quite expensive. But not anymore. The Yi Mini Dash Camera is a truly affordable, feature-packed dashcam that has your back when you need it most. The Yi Mini Dash Camera is the latest addition to Yi’s dashcam lineup, bringing their total up to five devices. The Mini is also one of the most affordable of the range, at just $45. As a barebones device, there aren’t many accessories or peripherals. In the box you’ll only find a micro-USB cable, cigarette lighter socket USB adaptor, and a user guide. The Mini requires a microSD card, although one isn’t supplied, so you will have to purchase your own. Yi recommends options between 8 and 64GB, in class 10 or above. The Mini comes fitted with an ultra-wide 140-degree angle lens, which makes it perfect for capturing everything going on around you. The device itself closely resembles many dashcams on the market, with the controls on the front; camera and mounting device on the back. This marks it out as unique in Yi’s range, where the cameras typically look more akin to action cameras like the GoPro. The Mini has a 2 inch LCD screen, with four hardware buttons underneath for navigation. If this were a touchscreen device, the screen would be too small, but with the addition of the physical buttons, it isn’t at all fiddly. At the first power up, you’ll be greeted with a screen and QR code prompting you to download the companion smartphone app. You may be hesitant to download yet another single-purpose smartphone app, but this one is worthwhile as it makes accessing the camera’s features a lot easier. The app creates a local Wi-Fi connection with the camera so you can browse videos, share them, and change the device’s settings directly from your phone. This is convenient as the Mini is intended to be mounted on your windscreen only once. The 3M sticky pad is attached directly to the device, rather than to a separate mount, so once it’s up, it’s designed to stay there. However, if you opt not to use the app, you can still manually remove the SD card. While there is an internal battery, it is small and only used for emergency recordings. For all other features, the camera must be connected to a power outlet via micro USB. The included cable is long enough to allow you to tuck it into the trim of your car, working its way up to your rear-view mirror. Most cars only send power to the socket while the vehicle is running. In this setup, the camera starts up and shuts down in line with the car. However, that is not the case for every car, so make sure to test yours first. This will prevent the camera remaining on and draining your vehicle’s battery. 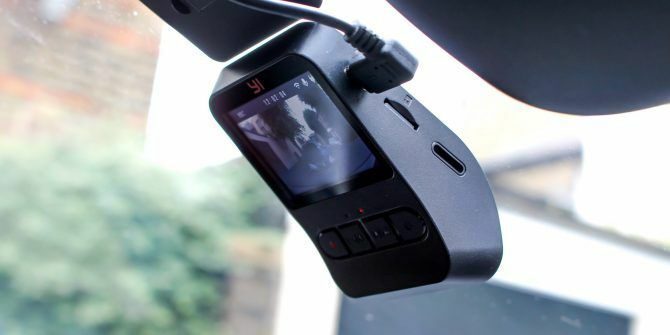 The Yi Mini uses loop recording to manage storage space automatically–a standard feature for nearly all dashcams. Instead of merely filling the card, forcing you to remove files manually, the Mini will record over old, unsaved footage. The result is that there is less maintenance for you to perform, as the camera looks after itself. The only exception to this is in the event of an accident or collision. The Yi Mini features collision detection, using the integrated G-sensor. When the camera detects a collision, the emergency recording function is activated. You can also manually activate emergency recording by pressing the left-most hardware button. Once activated, it records and saves the period before and directly after the collision. It is then securely stored and excluded from the loop recording feature. The only way for emergency recordings to be removed is for you to delete them manually. Either through the smartphone app or on the device itself, you can make some tweaks to the recordings and operation of the camera. There is a built-in microphone which you can disable, as well as modifying the G-sensor sensitivity. There’s a delay of about 20 seconds between powering on the car and the start of the recording. To get around this, I found it was easiest to start the car immediately, before getting myself settled. By the time I’d put my seat belt on, the camera was ready to go. The Yi Mini records continuously while the car is on, with a 10 second shutdown delay after the vehicle is turned off. The journey is broken into multiple sequential videos of either one or three minutes, depending on your preference setting. All recordings are visually timestamped, which helps to verify authenticity should an accident take place. As this is an entry-level device, you won’t find GPS or speedometer recordings marked on the videos. The recordings can be accessed and viewed on the camera, or via the smartphone app. The app also allows you to download the video to your phone, where you can share with your friends or cloud storage. However, I found this to be a painfully slow experience, taking almost five minutes to download a 30 second video. Your experience may vary, but it is probably easier to remove the SD card and view them on your computer. The Mini records in either 1920 x 1080 or 1280 x 720 resolution, at 30 frames per second. You can toggle between the two in the Mini’s settings. The low-light performance is good considering the price of the camera. The low-light videos aren’t sharp, but they aren’t a pixelated mess either, so you can easily pick out details. Dashcams have been mainstream for a few years, but the affordable end of the market has continually produced low-quality cameras. However, Yi has bucked that trend with the Mini. The camera is simple to setup, easy to use, and even comes with a useful and well-designed smartphone app. Seated behind your mirror, it’s also quite discreet. Crucially though, the recordings are crystal clear and far better than they have any right to be for a device costing just $45. Put it all together, and you have a device that is certainly worth the money, even if it is only for peace of mind while on the road. Explore more about: Dashcam, MakeUseOf Giveaway. Surprise the quality of the video are quite clear. Coincident I just plan to getting a dash cam. Good if I have won this and save me some bucks. Well there's still three days left to get your entries in - good luck! Is there a port/ support for a reverse camera? No, but they also have the Mirror Dash (https://www.amazon.com/YI-Dashboard-Recorder-Reverse-Recording/dp/B01CW4BI6G) which does dual recording.